You may have come across the term celadon in your ceramics reading or during visits to history or art museums. It was a method that not only dominated the early ceramics scene, but became a benchmark of influence for potters across the globe. Today some celadon pieces are so revered that they can reach hundreds of thousands of pounds at auction. The term celadon really has two different examples, firstly and possibly most commonly, it’s known as the beautiful and iconic jade green (or pale green/blue) colored glaze, however, it can also be known as being greenware with a transparent glaze. The glazes are notable for often having a slight crackle in them and are used on stoneware and porcelain pottery bodies. Celadon originated in China and some wares that have been discovered date right back to the Eastern Han Dynasty (the second imperial dynasty of China), from around 25 to 220 AD. 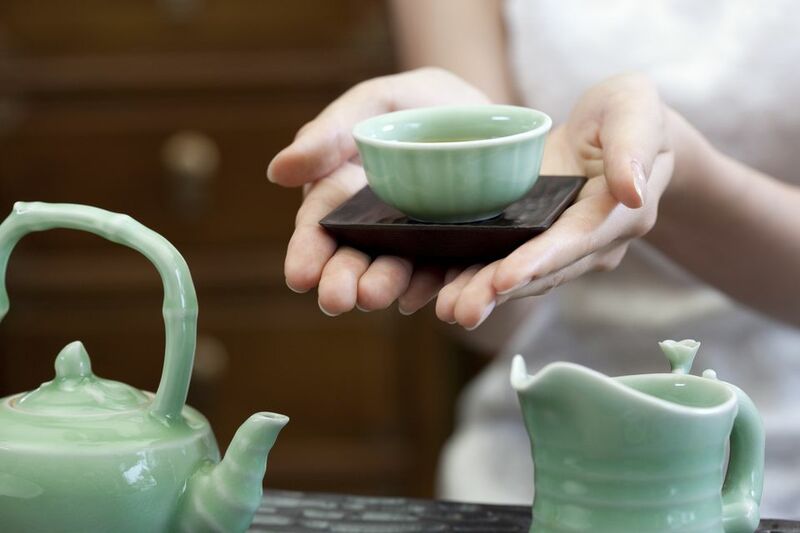 From this period many variations of celadon were developed, including the famous Yue ware and Longquan pottery (a city that sits on the Chinese coastal province of Zhejian). In China today and through its history, jade (sometimes known as Emperor’s Stone) is highly significant. In 3000 BC, it even became known as the ‘royal gem’. The symbolism of jade includes status, spirituality, purity and health. Celadon really came about from years of master potters trying to replicate jade’s exquisite coloring for ceramics. From its development in China, celadon moved quickly to other parts of the world and in Korea, Goryeo celadon became very popular. The Goryeo dynasty lasted five centuries from 918 to 1392 and the wares were typified by a more grey/green color. There are several opinions of where the term celadon came from, but a likely explanation is that it comes from the Sanskrit words for green and stone sila and dhara. The green/blueish coloring typifies nature and is hard to recreate, making it both mysterious and beautiful at the same time. Celadon is created using stoneware (or porcelain) and fired in a reduction kiln, one of the reasons being is this has the highest reaction with iron oxide, which is used in the glaze. The ingredients are carefully mixed (as not enough or too much of something can dramatically alter the final outcome). Some wares were coated with a thin layer of slip containing iron before they were glazed. The method of creating Longquan pottery is incredibly precise (as with all celadon wares) and actually goes through a cycle of six stages of heating and cooling. The temperatures reach a maximum of 1310 degrees Celsius and through the entire process, the firing of the stoneware glazes are carefully controlled. UNESCO states that in Longquan pottery there are two types of celadon: ‘elder brother’ which has a ‘black finish and a crackle effect’ and the ‘younger brother’ has a ‘thick lavender-grey and plum-green finish’. The rich coloring of traditional celadon comes from the fact it’s fired at very high temperatures, ranging from 2,300 F up to 2,381 F. Goryeo ceramics coloring comes mainly from the type of clay that’s used, as typically there’s a lot of iron in the clay, plus ‘iron oxide and manganese oxide and quartz particles in the glaze’. How Were Celadon Wares Typically Decorated? Across countries and centuries, celadon has seen a huge range of shapes, sizes, and uses. Throughout celadon’s high popularity (before it gave way to the newer trend of China’s blue and white pottery style) there were plenty of examples of very rounded bottles and bowls with decorations in the form of everything from floral embellishments to birds. Sometimes the works were etched with a delicate style called sanggam. The sanggam technique was very common in Korea and involved etchings being done into dry clay and then filling the pieces with black or white slip, then coated with a transparent glaze.